Want to double your quiz conversion rate rapidly? Experiencing low conversion rates of less than 50% and you want to boost your opt-ins? You have arrived at the conclusion that having a quiz is the best opt-in to get more leads AND you want to learn how to create a highly converting quiz that converts at 50% or more. You have a quiz but you’re struggling with a low conversion rate of less than 50% and don’t know how to get a higher quiz conversion rate. When I was a teenager, I loved to read lifestyle magazines. Especially in magazines like Marie Claire and Cosmopolitan that used to have some sort of quizzes from time to time. What I usually do is to head straight for the content page and locate the quiz section. I would see an exciting title relating to friendships, relationships, cleanliness level, health, fun-lovingness etc. The questions were often lively and the answer options were very entertaining. I enjoyed those quizzes because they identify me with either a certain celebrity type, tell me more about myself or answered a question I had harboured for a long time. In all of this scenarios, the outcomes either reaffirm what I’m already aware of or align me with my favourite celebrity or even offer a step towards my ideal outcome. I would usually feel pleased and satisfied after taking the quiz with the feeling I had received a piece of information around a topic I’m interested in. And I keep going back for more of the satisfaction and happiness. That’s the feeling you would want to generate with your quiz. Right at the start, you want to grab the attention to get quiz-takers started with your content. Then you want to create an entertaining journey throughout the quiz to keep them engaged and excited – right to the end. And at the end, you want them to feel as though you’ve answered one of their top priorities and gave them affirmations to what they already know. The result: a higher connectedness to you and your brand. So, how do you create a quiz that resonates with your audience? Brainstorm on the list of frequently asked questions from your customers. Identify the top questions and review how they can be built into a quiz. If you have an existing checklist for your current customers, that could be easily converted into something interactive to lure in highly qualified prospects! Keep in mind – at the end of the day, you want a quiz that addresses customers’ problem and ultimately sell a relevant product/service to your audience. A good quiz title makes ALL the difference in the world between attracting excited targeted audience to crack on with the quiz and folks staring at the title, wondering if it’s worth their time and possibly close the browser window. The primary purpose of a title is to grab attention within the first few seconds and entice people to start engaging. This is why the words you use and how your craft your title is vital to the success of your quiz. You can have the most fun quiz created but if your title doesn’t incentivize people to get their mouse moving, no one will ever discover your wonderful quiz and the wisdom contained within. An irresistible title will sell itself well and get the clicks while an mediocre title that lacks engagement will be overlooked and get lost in the sea of online information. Spend some time working on your title. It’s your headline and we know what they say about first impressions – you never get a second chance to make a first impression. Accompanying the title should be a light-hearted, colourful visual. Add life to your quiz, tap on their emotional buttons. Make them feel happy, proud, wanted – they’ll agree with you and connect better. The perks of leveraging emotions can be very powerful, and it’s how you do it that matters. Your quiz should keep to the same branding and design as your main site to boost your quiz conversion rate. The highest conversions occur when your customers don’t even notice a difference in design from your main site to your lead magnet quiz. Branding is a personality – “who you are” as a brand and you want potential quiz-takers to associate your quiz and your brand as ONE entity (not two!) early on. images you use in your quiz cover, questions and answers. Designing your content to be easily identifiable as part of your brand increases trust and in turn, generates leads. Think of the questions and answers as a dialogue between you and the quiz-taker. You don’t want the conversation to stop. You want a flow and the excitement to last all the way till the end. If you use complex words or phrase your answers in a complex way, the quiz-taker needs to pause and think. The longer the pause, the more likely the interest will recede and your quiz-taker is going to close the browser and drop off. Try to recall the last time you had an awkward conversation. The uneasiness and awkwardness. How did it make you feel? Did either you or the other person make a hasty exit? Visuals help to lighten up the tone of the questions and also make it easier for the quiz-taker to comprehend your questions quicker. The easier it is to understand, the faster the quiz-taker will breeze through the quiz and get to the end. Use simple words and keep your sentences short. Everyone wants to laugh, everyone wants to feel good. If you can convey humour through your questions and answers, it will keep your quiz-taker hooked. 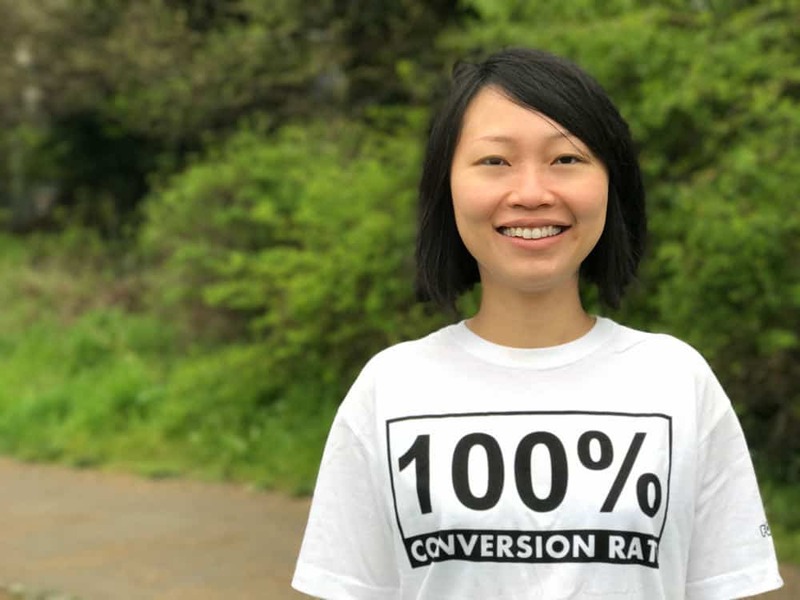 This is the make or break point for your quiz conversion rate. It’s where you know the results of the groundwork you’ve laid upfront. The recommended three pieces of information to ask for is the: first name, last name and email address. Yet, it’s not that straightforward. Asking for personal information is an art to be mastered. Underlying this art is essentially trust in you for your web visitors to hand over their personal information. And this trust needs to start accumulating from the first contact with your quiz title and image. You are practically an anonymous stranger to them and you want to gradually prepare them to trust you with their contact information. In other words, ensure you come across as legitimate. Make it easy for them to say yes. This is a delicate process. You’ll need to balance the fine act between engaging them without being overly pushy or anxious to please them. Be very conversational in the questions so asking for a lead at the end isn’t too much of a stretch. Once you start breaking down the barriers, get them to think and involve their emotions. Your quiz takers would most assuredly be interested in opting in to get their results. You can also reiterate what they will get out from the results and throw in an incentive bonus. Typically, a complimentary gift to the quiz results that will help them to solve a problem would be an attractive option. The conversation doesn’t stop after your quiz-takers have opted in and turned into a prospect. That’s when you initiate your nurturing process to transform them into long-term customers. You’ve something valuable to offer them. Show it to them through personalized results and recommendations. Give them a small actionable recommendation so they can initiate a change whether it is to make a decision or solve a problem. Beyond the results page, follow-up relevant email content extends the dialogue further. The content could be tips, encouragement, further call-to-actions to prompt your prospects to advance towards the unique guidance you can offer. As your relationship approaches maturity, pitching and converting them into paying customers becomes natural. So, how many of those tactics have you adopted so far? Quizzes boast exceptional opt-in rates and is a terrific way to capture leads and direct them into a sales funnel. If implemented correctly, maximizing your quiz conversion rate to 50% and above is not inconceivable. If you need a hand with creating a quiz with a high conversion rate, contact us. This entry was posted in Conversion Rate, Lead Magnet, Quiz and tagged double conversion rate, listbuilding, quiz. Hi Clarice, I agree with you that the title (i.e. headline) is one of the most crucial elements of a quiz. About 80% of people only read headlines, so that’s really the only chance to catch their attention! Thanks for sharing your tips. Totally, Isabelle! The title of the quiz is like the front page of the magazine – it needs to be catchy enough so people wants to click for more.